Part 2: Earlier this week, I shared a presentation I am working on for the EdTech Coaches Playground at ISTE 2015. It focuses on supersizing your professional development. Today, I share the Ultimate Guide to Your Resource Center. In it, you will find the tools for building your own innovation Site for students and staff. Check out Fennovation.org for more resources! I’m sharing out my favorite PD ideas and topics to the EdTech Coaches playground at ISTE this year. In preparation for it, I’ve put together some of my favorite PD sources and ideas for implementation. In the nature of sharing (since these ideas came to me from others), feel free to share out! Check out Fennovation.org for more ideas as well as the Supercharge your PD presentation. We’ve all heard it: I don’t want to be here, Why are they making us be here?, Why can’t I just be in my room working, and the list goes on and on. Professional development in education can feel like pulling teeth. On one hand, teachers are overworked and desperately need the time to work. But, on the other hand, professional development is REQUIRED by the state and it is necessary to go outside one’s comfort zones. Educational Professional Development is also a lot different than education for adult learners. I’ve worked with a variety of adult learners and the outcome is usually different than professional development sessions. For instance, we I assist a teacher in his/her classroom, teachers are engaged and ready. However, when I put it in a training, some teachers are readily engaged, but some are uttering the familiar why are they making us be here? So, what is the perfect blend? At what rate will learners disagree with the training just because? And, where do we make systemic changes in professional development? Is this problem specific to education or is it in professional development in general? We will probably never have 100% agreement on any topic, but I do believe we can have learning. Today, I helped coordinate a professional development session called Warrior Chef, modeled after Krista Moroder’s ISTE session titled, EdTech Chef. As a participant of the ISTE session, I loved it. It was not a sit-n-get. Instead, it involved partnering teachers across the curriculum and challenging teachers to create. It’s different. Most PD I have attended, I sit and work on something else. I’ll admit it. I am a heavy user of Google + and Twitter so I find I learn most content-based sessions through my social networks. That’s why this form of PD was entertaining to me – the content was fresh and completely-teacher driven. Last year, I organized a modified EdCamp for my teachers and it went off fairly well. However, today’s session did not feel as successful. Why? We put in a TON of work behind the scenes creating the materials necessary to take out the legwork for 150+ teachers. Having issues with Google Spreadsheets (limit of editing users) did not help matters, but I believe the issue stemmed deeper. When we did the EdCamp, it was AFTER school was out. There was not a desire to get back and work. However, there was a desire to just go home. Perhaps this was fueled by just returning from a break and being asked to create. Or, maybe, it’s because they have not been asked to create before. I love EdCamps. They are holistic, but they do not always challenge someone to create or leave with a creation. I think that is a missing element. And, perhaps, since this is so rarely seen in professional development, educators revolt. Thoughts on what makes professional development work for you? 1. Give back-ups to submitting projects. There is a limit of editors on Google Spreadsheets. You must take in account those who are just lurking in the documents as well. 2. Don’t do it with so many people. It’s great to allow everyone to present. With too many people, this opportunity goes missing. Do it on alternating staff development days. 3. Provide the training on days when grades are not due or on days other than returning or leaving for break. 4. SMILE. They are watching. And, it will make you happier too. 5. 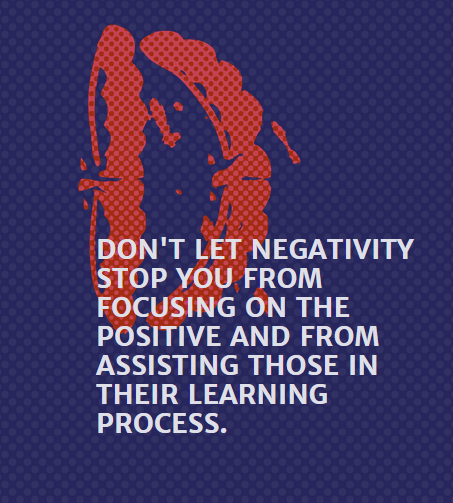 Don’t let negativity stop you from focusing on the positive and from assisting those in their learning process.